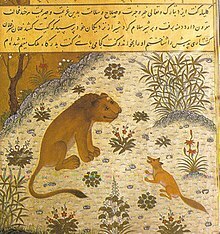 Kelileh va Demneh Persian manuscript copy dated 1429, depicts the Jackal trying to lead the Lion astray. Topkapi Palace Museum in Istanbul, Turkey. 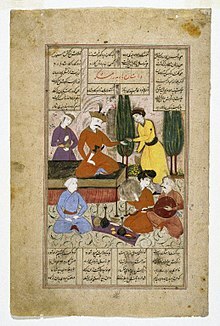 Persian literature (Persian: ادبیات فارسی‎, Adabiyât-i fârsi) comprises oral compositions and written texts in the Persian language and it is one of the world's oldest literatures. 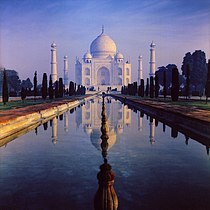 It spans over two-and-a-half millennia. Its sources have been within Greater Iran including present-day Iran, Iraq, Afghanistan, the Caucasus, and Turkey, regions of Central Asia (such as Tajikistan) and South Asia where the Persian language has historically been either the native or official language. For instance, Rumi, one of best-loved Persian poets born in Balkh (in what is now the modern-day Afghanistan) or Vakhsh (in what is now the modern-day Tajikistan), wrote in Persian and lived in Konya, then the capital of the Seljuks in Anatolia. The Ghaznavids conquered large territories in Central and South Asia and adopted Persian as their court language. There is thus Persian literature from Iran, Mesopotamia, Azerbaijan, the wider Caucasus, Turkey, western parts of Pakistan, India, Tajikistan and other parts of Central Asia. Not all Persian literature is written in Persian, as some consider works written by ethnic Persians in other languages, such as Greek and Arabic, to be included. 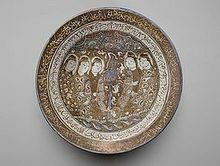 At the same time, not all literature written in Persian is written by ethnic Persians or Iranians, as Turkic, Caucasian, and Indic poets and writers have also used the Persian language in the environment of Persianate cultures. Bahram Gur and Courtiers Entertained by Barbad the Musician, Page from a manuscript of the Shahnama of Ferdowsi. Brooklyn Museum. So strong is the Persian inclination to versifying everyday expressions that one can encounter poetry in almost every classical work, whether from Persian literature, science, or metaphysics. In short, the ability to write in verse form was a pre-requisite for any scholar. For example, almost half of Avicenna's medical writings are in verse. The most significant prose writings of this era are Nizami Arudhi Samarqandi's "Chahār Maqāleh" as well as Zahiriddin Nasr Muhammad Aufi's anecdote compendium Jawami ul-Hikayat. Shams al-Mo'ali Abol-hasan Ghaboos ibn Wushmgir's famous work, the Qabus nama (A Mirror for Princes), is a highly esteemed Belles-lettres work of Persian literature. Also highly regarded is Siyasatnama, by Nizam al-Mulk, a famous Persian vizier. Kelileh va Demneh, translated from Indian folk tales, can also be mentioned in this category. It is seen as a collection of adages in Persian literary studies and thus does not convey folkloric notions. The oldest surviving work of Persian literary criticism after the Islamic conquest of Persia is Muqaddame-ye Shahname-ye Abu Mansuri, which was written during the Samanid period. The work deals with the myths and legends of Shahnameh and is considered the oldest surviving example of Persian prose. It also shows an attempt by the authors to evaluate literary works critically. Georgian manuscript of Shahnameh written in the Georgian script. Khalilollah Khalili on the cover of "Deewaan-e Khalilullah Khalili"
^ Spooner, Brian (1994). "Dari, Farsi, and Tojiki". In Marashi, Mehdi. Persian Studies in North America: Studies in Honor of Mohammad Ali Jazayery. Leiden: Brill. pp. 177–178. ^ Spooner, Brian (2012). "Dari, Farsi, and Tojiki". In Schiffman, Harold. Language policy and language conflict in Afghanistan and its neighbors: the changing politics of language choice. Leiden: Brill. p. 94. ^ Campbell, George L.; King, Gareth, eds. (2013). "Persian". Compendium of the World's Languages (3rd ed.). Routledge. p. 1339. ^ Frye, R. N., "Darī", The Encyclopaedia of Islam, Brill Publications, CD version. ^ C. A. (Charles Ambrose) Storey and Franço de Blois (2004), "Persian Literature - A Biobibliographical Survey: Volume V Poetry of the Pre-Mongol Period", RoutledgeCurzon; 2nd revised edition (June 21, 2004). p. 363: "Nizami Ganja’i, whose personal name was Ilyas, is the most celebrated native poet of the Persians after Firdausi. His nisbah designates him as a native of Ganja (Elizavetpol, Kirovabad) in Azerbaijan, then still a country with an Iranian population, and he spent the whole of his life in Transcaucasia; the verse in some of his poetic works which makes him a native of the hinterland of Qom is a spurious interpolation." ^ Abdolhossein Zarrinkoub, Naqde adabi, Tehran 1959 pp: 374–379. ^ Iraj Parsinejad, A History of Literary Criticism in Iran, 1866-1951, (Ibex Publishers, Inc., 2003), 14. ^ See William Shakespeare's The Twelfth Night. ^ Giunshvili, Jamshid Sh. (15 June 2005). "Šāh-nāma Translations ii. Into Georgian". Encyclopædia Iranica. Retrieved 28 May 2012. ^ Farmanfarmaian 2009, p. 24. ^ "Nietzsche's Zarathustra". Philosophical forum at Frostburg State University. Retrieved 2006-03-31. ^ "Latif Nazemi "A Look at Persian Literature in Afghanistan"" (PDF). Archived from the original (PDF) on 2008-02-27. ^ "گلرخسار صفی اوا، مادر ملت تاجیک". BBC Persian. Retrieved 2006-03-31. ^ "مومن قناعت، شاعر و سیاستمدار". BBC Persian. Archived from the original on 2012-12-23. Retrieved 2006-03-31. ^ "فرزانه، صدای نسل نو". BBC Persian. Archived from the original on 2013-01-14. Retrieved 2006-03-31. ^ "پویایی فرهنگ هر کشور ی در "آزادی" نهفته است". Archived from the original on 2005-11-29. Retrieved 2006-03-31. ^ "A history of literary criticism in Iran (1866-1951)". Retrieved 2006-03-31. ^ "Luminaries - Mohammad Reza Shafiei-Kadkani". Iran Daily - Panorama. 2005-09-24. Archived from the original on 2006-05-17. Retrieved 2006-03-31. ^ "همایش بزرگداشت افصح زاد Archived 2012-07-22 at Archive.today" at BBC Persian. Accessed on 2006-03-31. ^ Houra Yavari, "The Persian Short Story"
^ Wali Ahmadi "The institution of Persian literature and the genealogy of Bahar's stylistics"
^ "Parvin Etesami's biography at IRIB.com". Archived from the original on 2008-01-12. ^ a b Mansur Khaksar "Shamlu’s poetic world"
^ "جایزه شعر بیژن جلالی به سیمین بهبهانی اهدا شد". BBC Persian. Retrieved 2006-03-31. ^ "معرفی منتقدان و پژوهشگران برگزیده شعر". BBC Persian. Retrieved 2006-03-31. ^ Mahmud Kianush, "A Summary of the Introduction to Modern Persian Poetry"
Farmanfarmaian, Fatema Soudavar (2009). Arjomand, Saïd Amir, ed. "Georgia and Iran: Three Millennia of Cultural Relations An Overview". Journal of Persianate Studies. BRILL. 2 (1): 1–43. doi:10.1163/187471609X445464.